Executive Desk Set is approximately 4"X7" shown here with gold inscription plate finish and chrome and gold pen--the perfect executive gift desk accessories..
For Big Problems For Small Problems"
With beautiful 9mm Arcadia ball point pen by Cross with chrome and gold combines style and durability. Executive Desk Set w pen (above), or the Office Desk Set (below), make a novel and practical executive gift item for the overburdened executive. For centuries, man has held the pendulum over charts and directed questions to his/her subconscious mind to solve problems. Today, more than ever the modern executive can use all the help he can get. 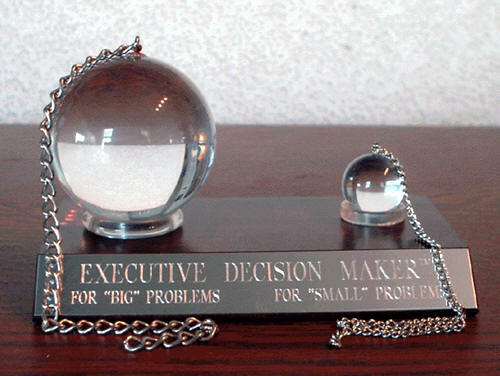 For big problems, we've outfitted both the handsome Executive Desk Set and the Office Desk Set with a BIG 2 1/2" diameter pendulum. For small problems, there is a small 1" diameter pendulum. And just in case he/she'd like to make notes, the Executive Desk Set is available with either a beautiful silver pen by cross or a black with gold ring Arcadia pen by Cross. Both the Executive Desk Set and the Office Desk Set make the perfect desk accessories and create an initial curiosity which turns to enduring intrigue. A conversation piece for home or office. Both desk accessories have a fine wood base. Both the Executive Desk Set and the Office Desk Set are handsomely scripted as shown on either gold or silver inscription plate finish. Office Desk Set is approximately 4"X7" without pen--desk accessories every desk should have. Shown with silver inscription plate finish. 1. Mail in order form for checks/money orders (any dollar amount or credit cards ($50 minimum)--see options #3 and #4 for no other dollar minimums. Continental U.S. only. International orders, email your order to receive shipping/mailing/handling charges before issuing payment. 1-800-993-0929 in continental US. or 732-933-7620 in continental US. There is a 10% fee charged for phone orders. Everything Desk, from Adjustable Desks to Z Line Desks.